This is a 3-in-1 Game set for the BlackBerry PlayBook. It plays games on an 8 by 8 board with colored marbles. Two of the games are similar, but different from the popular Match-3 games and the SameGame variants. 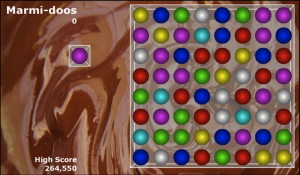 The third game plays the popular board game known as Othello or Reversi. Each game has its own customizable background image and an UNDO function. There is also a Demo mode where you can watch the game play without interacting. Ghost Slider is a classic sliding block puzzle Game in OmniGSofts Eternal Throne game theme.